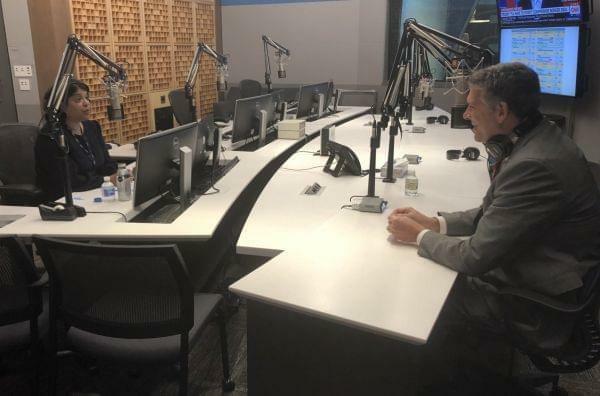 Rep. Darin LaHood (R), speaking with Niala Boodhoo at NPR in DC in February 2019. We check in with Rep. Darin LaHood about trade, agriculture, and Secretary Kirstjen Nielsen's resignation from the Department of Homeland Security. Plus, it's been about a month since a Boeing 737 Max 8 crashed in Ethiopia—so what's changed for Boeing since then? We'll also learn about the new 'Real ID' driver's license additions that will be required for domestic air travel starting next fall, and hear from you about your favorite fish fries in Illinois. Kirstjen Nielsen has become the most recent cabinet member to leave the Trump administration. She served as Secretary of Homeland Security, which included overseeing the border between the U.S. and Mexico. We had a chance to check in with Republican Congressman Darin LaHood about that yesterday afternoon just before he headed back to Washington. We also talked about ag, trade with China, and flooding. Representative LaHood represents Illinois’ 18th Congressional district, which includes all or part of 19 counties across central and western Illinois, including Peoria, Springfield, and Bloomington-Normal.
.@RepLaHood says that while he thinks former DHS Secretary Kirstjen Nielsen "served the office well," it's the president's prerogative to "go in a different direction." If you’ve ever flown, you know the drill: have your boarding pass and ID out and ready. But, starting next year, your regular old driver’s license will no longer do the trick. You’ll need something called a Real ID to board a domestic flight. It will look almost identical to your current license, except for a small gold star in the right hand corner. After more than a decade of back and forth, the Illinois Secretary of State’s office officially began issuing Real IDs at some facilities in January. And, as of last month, all Illinois residents are able to get the new driver’s licenses and state IDs. For more on this we spoke with Henry Haupt, a spokesman for the Illinois Secretary of State’s Office. Dan Petrella also spoke with us, He's a state government reporter for the Chicago Tribune. Nearly a month ago, Ethiopian Airlines flight 302 crashed just six minutes after takeoff. All 157 passengers and crew were killed. They were on board a Boeing 737 Max 8. That’s a name you might be familiar with by now, because last month’s crash was actually the second one in five months. In Indonesia, another 189 people were killed in October. Both crashes involved what appear to be similar problems with the Max 8. Since then, this particular model has been grounded, both in the US and around the world. And all the while, Boeing has been facing all kinds of questions, whether it’s the future of the 737 Max 8, or whether they could have prevented these two deadly crashes. Claire Bushey has been reporting on this for Crain’s Chicago Business. If you drive around northern and central Illinois looking for something to eat, it’s not too hard to find a fish sandwich special on Fridays. That’s of course not a coincidence. For many Christians who observe Lent - eating fish on Fridays has historically been a common way to abstain from eating meat during the lead up to Easter Sunday. Even though this is also the time of year lots of restaurants add fish to their menus - for many churches, feeding people fish is good a way to build community and raise money. If you’re not looking for a fish sandwich, you might just find a good fish fry at a church near you. One of those fish fries is in Urbana,at St. Patrick’s Catholic Church. Joseph Youakim has been volunteering at their fish fries for years. We also spoke with Mary Carter, founder of Carter’s Fish Market in Springfield, and Cristina Traina, professor and chair of Northwestern's Department of Religious Studies. We also heard from listeners via text! Save our number: 217-394-9765. One more from after the show: Holy Cross Parish, Champaign baked and fried fish with all the trimmings. Fries, coleslaw and drinks included. Cake $0.50. Very inexpensive bring the family but best tasting fish in town. 5-7 pm Friday. 300 meals served.